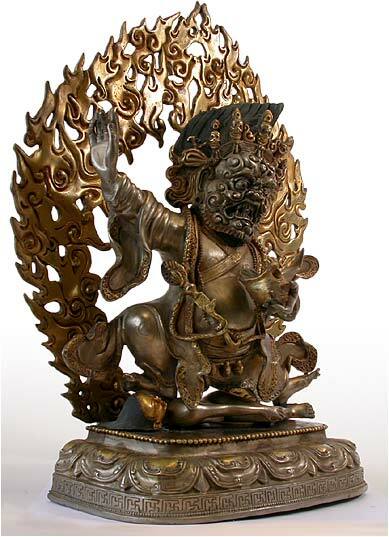 There are seventy-five emanations of Mahakala, the Tibetan Lord of Time: he who ultimately absorbs all things back into original essence. 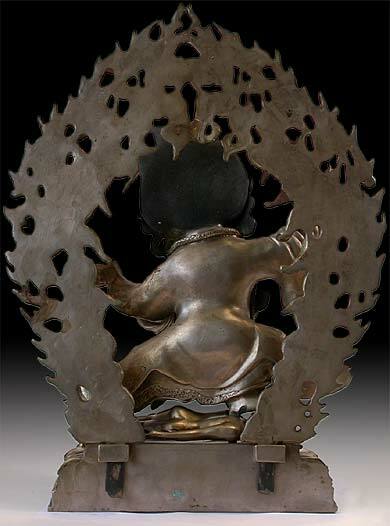 This bronze silver and gold gild Sino-Tibetan statue is a magnificent rendering of this deity. Here he is fierce, active and in constant movement surrounded by flames of illuminating awareness. The deity wears a crown of five skulls. Present on every form of Mahakala, these skulls represent the transmutation of the five negatives afflictions of human nature into positive virtues. Thus, ignorance transforms into the wisdom of reality; pride becomes the wisdom of equanimity; attachment becomes the wisdom of discernment; jealousy becomes the wisdom of accomplishment and anger transforms into mirror like wisdom. 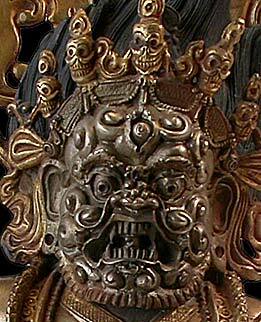 Mahakala’s third eye is prominent open and staring. The expression of his face is fearsome. At the bulge of his full belly a sword is ready to cut through obstacles and demons on the path, representations of our ignorance. The sword is clasped by a sinuous snake that wraps around Mahakala. 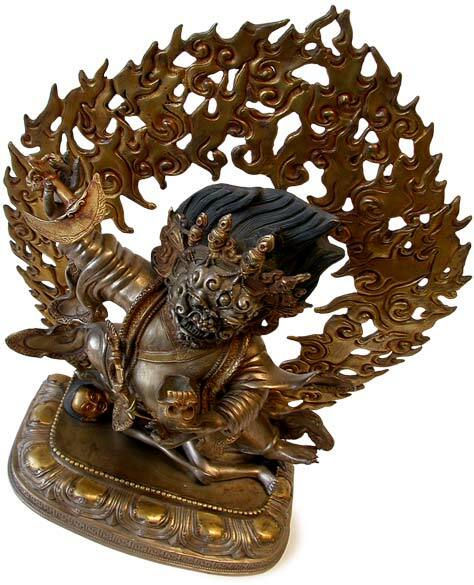 In his left hand, Mahakala holds a skull filled either with the life blood of oath-breakers and hindering spirits or nectar in which mental agitations and illusions are swallowed to create awareness devoid of mental obscurations. 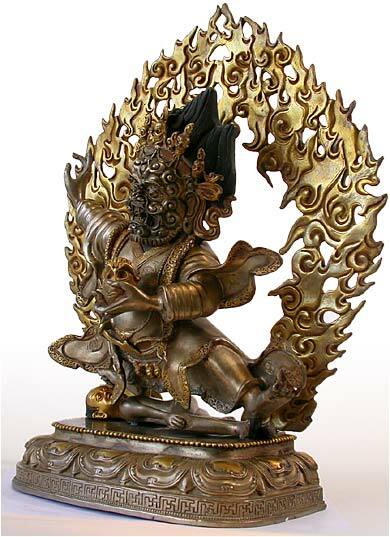 In his right hand, Mahakala holds a powerful vajra, sword chopper of wisdom. 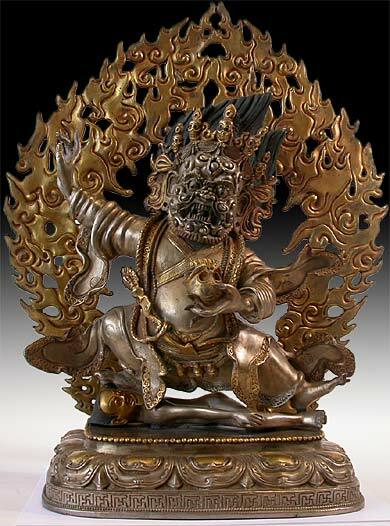 Mahakala ecstatically dances as Vinakaya the King of Obstacles, represented here in human form.